Oxford Film Festival Take 5 With...: Take 5 with "Parted"
The 7th annual Oxford Film Festival is getting closer every day. Before we kick off another fun-packed festival, we thought we would take five with filmmakers and get to know them just a little better. Michael Williams is a familiar face as he screened at the 6th film festival last year with "(un)wanted." A Mississippi native, Williams recently graduated with his film degree at the University of Southern Mississippi. His film "Parted" will be featured Saturday 3:00pm (S3) with Mississippi Narrative Shorts Block #1. Michael Williams is scheduled to attend. MW: "Parted" is a classic war, love story set in 1969. MW: This was the most ambitious film I have ever made, and I would not have been able to accomplish it without the wonderful cast and crew. I learned the importance of surrounding myself with talented cast and crew that I knew I would enjoy working with. That was also the best part of making the film. It was a pleasure working with each one of the cast and crew and seeing everything in the two day production come together better than I anticipated. MW: I just recently graduated from the University of Southern Mississippi with a bachelors in film and am pursuing a career in the film industry as a camera assistant. Since 2007, I have been working on independent films as an AC and various other crew positions, and I aspire to become a cinematographer. MW: I hope this film can continue to have more festival screenings in 2010 and hopefully open up more opportunities for me and people involved. MW: The future for "Parted" will probably be limited to more festival screenings. 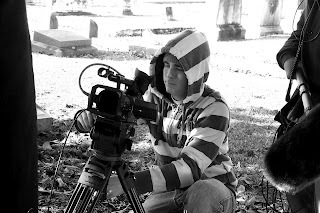 For me, I hope to produce a couple of short films in 2010 while continuing to run Shendopen Productions while also working as a camera assistant in film and ultimately becoming a cinematographer later in my career.